A few weeks ago, I mentioned to you guys that I want to makeover my Laundry Room. On a budget! The makeover is going well so far! I’m really happy with how everything is coming along and I’ve managed to keep it under $100 so far (but there is more to do so we’ll see where it ends up). 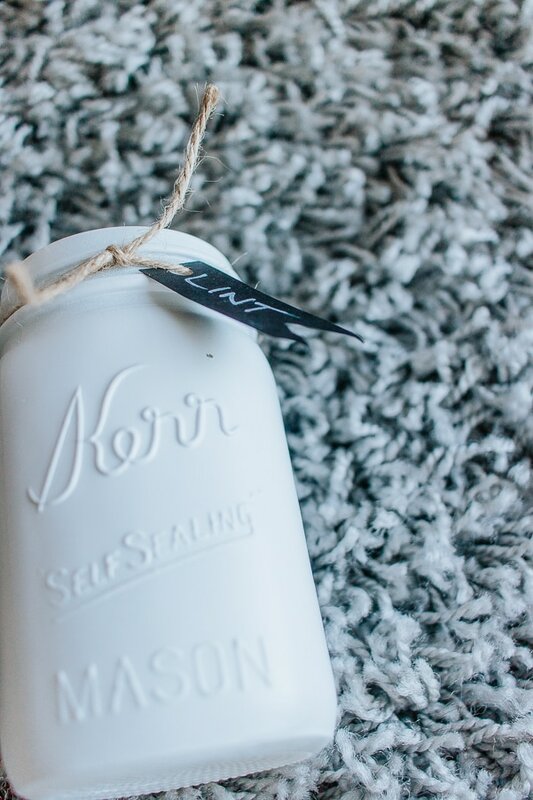 Anyways, I’m back today with a simple project for a DIY lint bin. I’ve found this little DIY to be super useful to me in the laundry room and it didn’t take long to finish at all. Plus – if you guys watch the video, you can get a little sneak peek of the current progress in my laundry room. Still have a few more projects up my sleeve though so it’s not quite ready for the full reveal yet. Here’s a little backstory on the inspiration for this lint bin. For a while, I had no garbage can whatsoever in my laundry room. 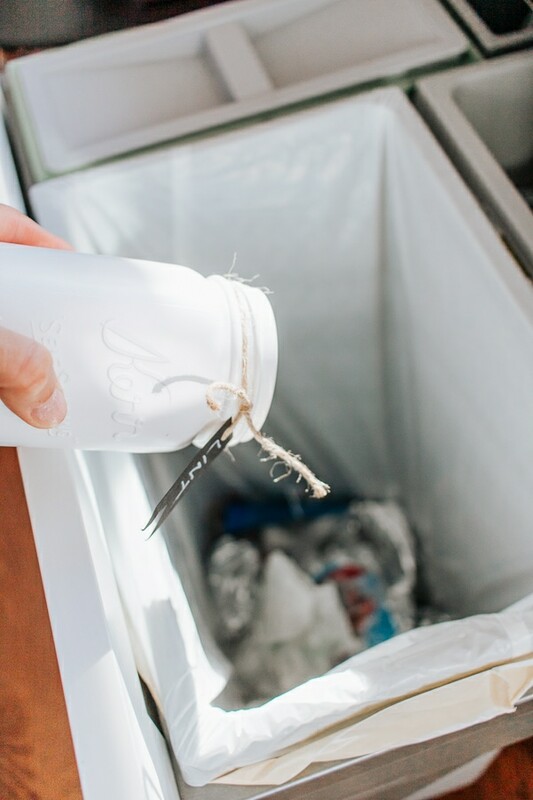 When I would empty out lint from the dryer or dryer sheets, I had to carry it over to our bathroom trash can. Not a huge deal but it turned into a major inconvenience. To the point where instead of trashing it right away, I was just leaving little lint balls on my laundry shelf to dispose of at a later time. By the end of the week, I had six or seven lint balls staring at me. I think it’s safe to say I needed a little lint bin! I came up with this idea to make a magnetic lint jar that I could stick to my dryer and just empty out and replace as needed. This little lint bin has been a whole new world for me! My shelves stay clean and it doesn’t take any up any space in my tiny laundry room. Perfect! If you guys are in the same boat, where you just need something little and convenient, I think you will like this project. I made a quick video on how I did this (see below). 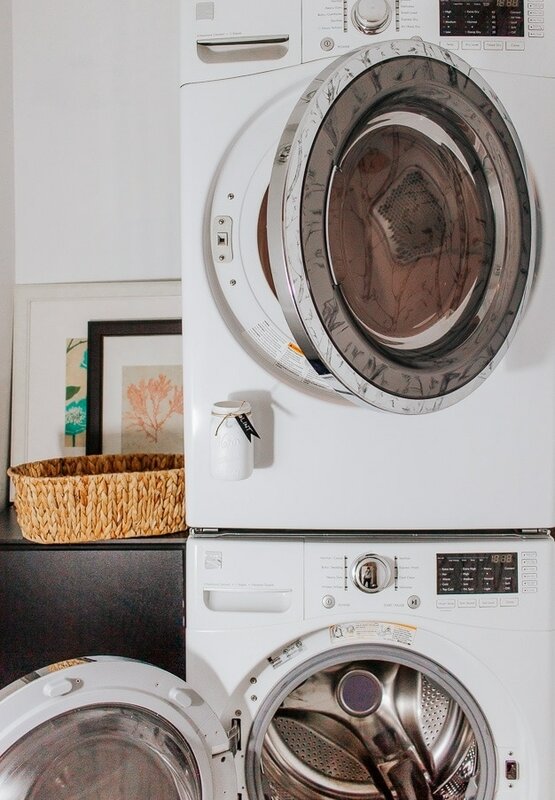 I hope you guys enjoy this quick DIY for your laundry room! In case you would rather read, here are the steps. 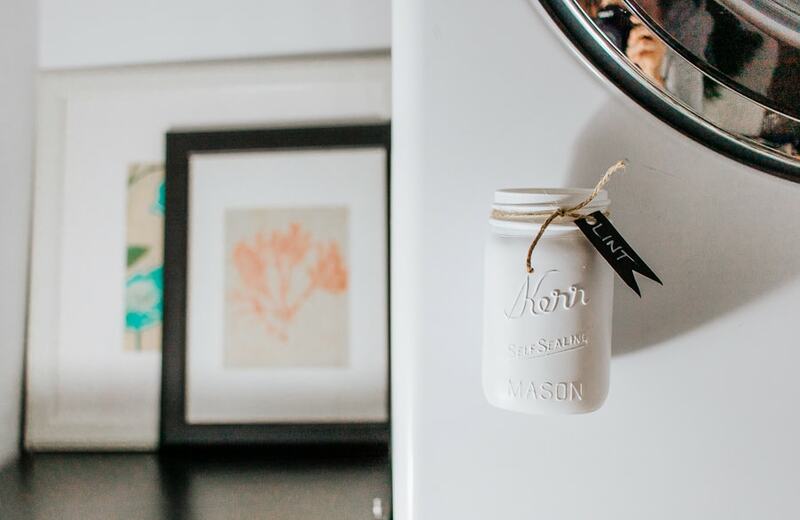 First, you want to spray paint your mason jar and allow it dry. 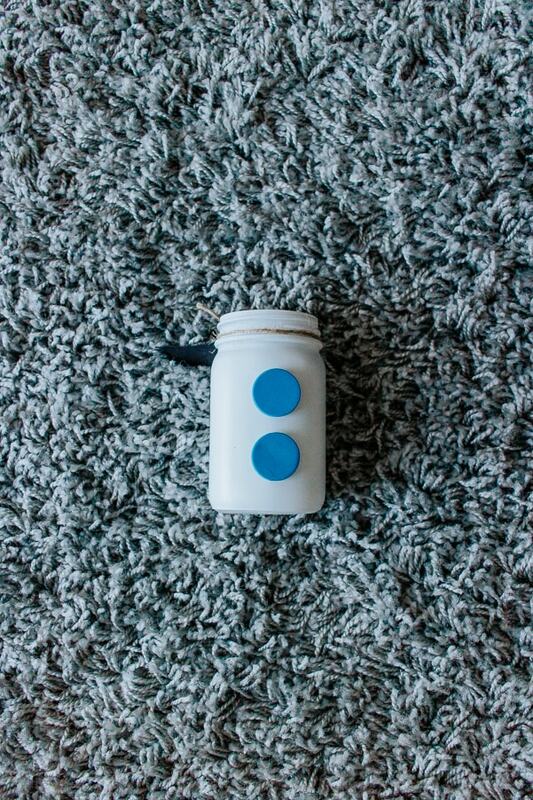 After the paint has fully dried, use a dab of hot glue to attach your two magnets to the back of the jar. (I got these little magnets for 25 cents a piece from my hardware store!) 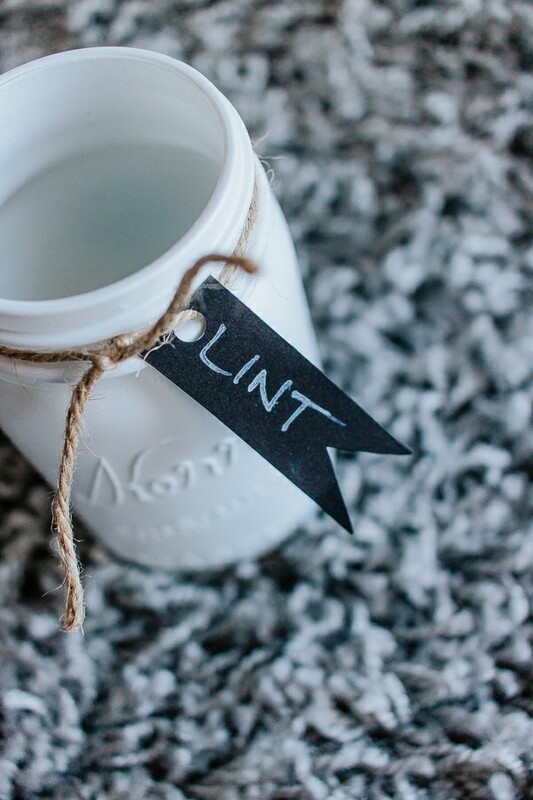 Then cut a little label out of cardstock or just use a label and attach to your jar using jute twine. Then, just stick it to your dryer. Voila! A place for lint. Simply empty it out when it’s full and replace. 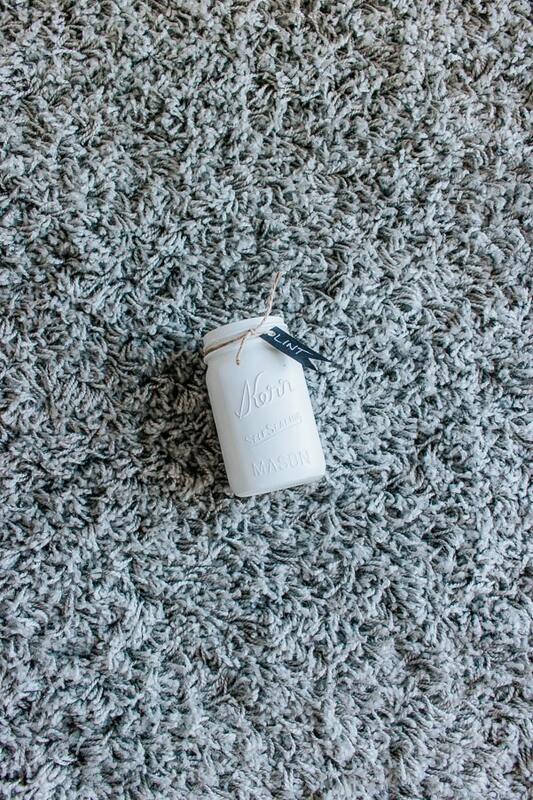 This is also a great way to use up one of those mason jars that we all have sitting on a shelf somewhere. 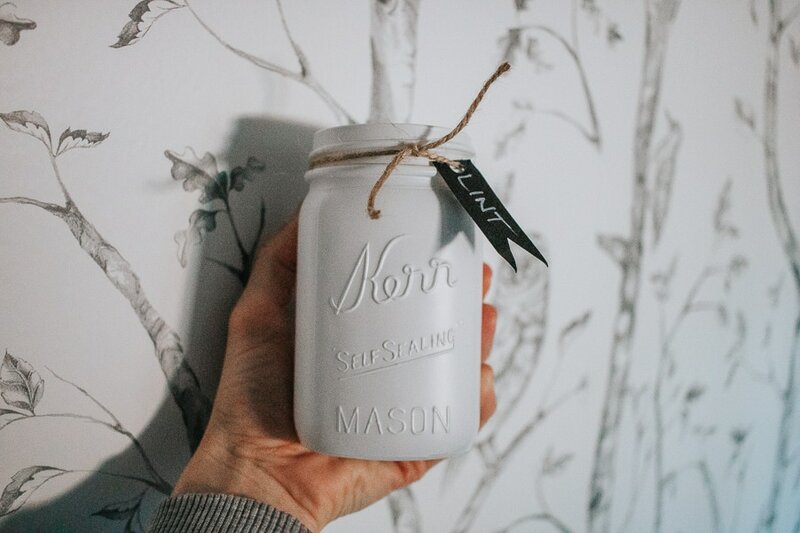 As much as I love to purge stuff, why is it so hard to get rid of mason jars? I guess because I always end up finding a use for them and they are just so dang pretty. Amiright?